It’s #MumBag and #MumBoss #Monday where some very talented and interesting women let us into their minds and their bags to see their inner workings. When Jess Bahia’s baby daughter started to sit up by herself, she realised that Mala could do with a comfy little chair of her own to sit safely in for her bottle/ book/ snuggly time without falling off. We’ve all heard that awful thud, let’s face it. After looking about for something suitable the only options she found were big, plastic, pink and covered in characters which was totally NOT what she was after. Jess had an idea for a mini kids sofa, spotted a gap in the market and the idea of Mini Sett was born. They launched in 2016 with 3 mini ‘flip’ sofas that are made in stylish neutral colours, screen-printed in the UK with line-drawn animal illustrations (Badger, Swan and Kingfisher) and are 100% washable premium cotton. They have a pocket to fit a favourite book and handle so they can be pulled around with ease and are designed for children aged 6 months to 7 years. What does your business do in a nutshell? At Mini Sett, we design and create contemporary home-wares for children that complement any stylish modern home. Our first product that we launched in 2016 was our kid’s mini flip sofa; perfect for reading, resting and watching their favourite film that sits perfectly in any stylish living room or children’s bedroom. In 2017, we’re launching a new, beautiful children’s bedding range, featuring our unique animal designs in grey and white and monochrome. When did you start it and why at that time? Summer 2016 was our initial launch at Dot to Dot London – but we started 9 months prior with extensive product development, testing and refinement. The timing seemed right, as my daughter was doing 3 full days of nursery, which finally gave me some uninterrupted time to think, plan, meet suppliers and work on my laptop – alone! Finding a screen printer in the UK who could deliver the print quality of our intricate hand-drawn Illustrations on soft cotton fabric that can be machine-washed, without losing the design detail. What has been your proudest moment? Featuring in Tatler magazine alongside other premium British brands. You seemed to have found your ‘thing’ – how did you come across it? I have worked in brand and product development for over 15 years for big branded companies and a few small ones and I love finding opportunities in the marketplace for new products, new consumers, new usages, and thought why not create my own products. Why home-ware? I have also always loved home-wares (worked in home-ware retail for 5 years back in Australia when at University (20 years ago – yikes! ), and have always loved beautiful products for the home. Plus when I had my first child I felt that there was very little available in the way of modern, stylish home-wares for children. 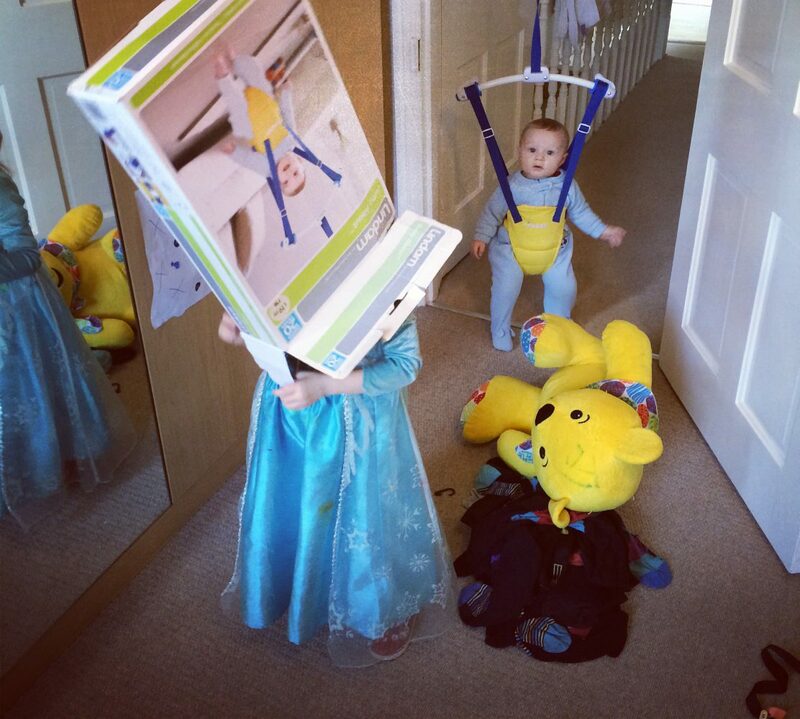 What is your best mum hack for making it all work? Work in small blocks of time – usually 2 hours. Allocate time for thinking and working on a key priority everyday. I tend to work best in the morning after the school drop off. I also only check my emails first thing (before my daughter gets up, whilst in bed! ), then again at lunchtime and before the school pick. I close down my email program otherwise I get too distracted and could just spend the day emailing which is not very productive. What encouragement would you give a mum thinking of starting her own thing? Just go for it. Find something that you passionately believe in and are proud and enthused to tell people about everyday. You’ll never work as many hours and for as little money (at first) as you do your own business, so you have to love what you do. Ask more questions. Find out more about how and why things are done when at work. When you’re young and inexperienced, you tend to think you know everything already (I know I did!) and that asking how or why, may seem stupid. Be open to constantly learning and asking questions from your boss, more senior people around you and your parents. People love sharing their experience and imparting their knowledge with younger people. This is invaluable learning. Will you show us your #MumBag? Food: 4 – muesli bar, fruit pouch, Mint polos, random sweets that have fallen out of their packet, bottle of water. Drugs: 0 – I don’t have anything. Clothing: 0 – I’ve never carried spare clothes – I’m an unrealistic optimist who is often cold or with a child with muddy clothes! Skank: 3 – Always a dirty tissue or dried up used wipe, crushed biscuits or old raisins. Work things: 7 – paper diary (I’m old school), felt-tip pen (I cannot write with a biro! ), a notebook, business cards. What is the most comedy item you have found? Yesterday, I found the detachable mouse tail from my daughter’s One-sie, that she wears after swimming lessons – so random. What is the oldest item in there? My Mason & Pearson pink hairbrush that I was given by my mum, when I was 4! What is the item you’re most proud of? My notebook – it’s a little book of random ideas and creative inspiration. Mrs Yellow supports PANDAS FOUNDATION who support mums with PND. If you like what you’ve seen and want to help a good cause you can text PAND45 £3 (or £1, £2, £4, £5 or £10)to 70070. Text costs amount donated plus network charge. PANDAS Foundation receives 100% of your donation. Obtain bill payer’s permission.